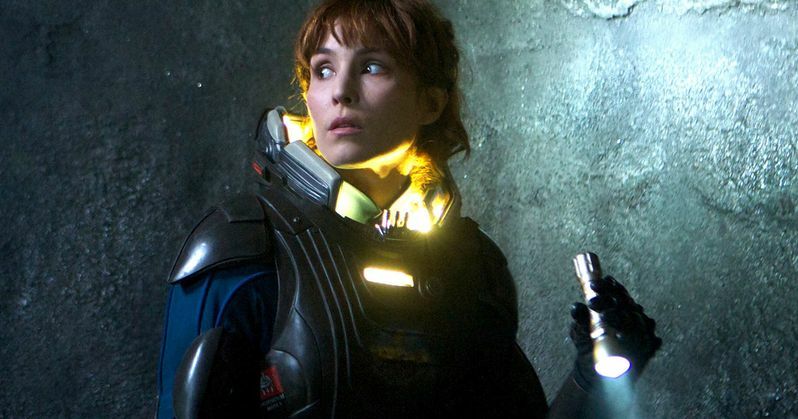 Noomi Rapace Not Returning for Alien: Covenant? As we reported earlier today, Alien: Covenant is the official title of Ridley Scott's Prometheus sequel. 20th Century Fox has revealed the official logo and release date, with the film arriving in October, 2017. They've also shared the first synopsis. And it reveals what could be a startling revelation. Is Noomi Rapace's Elizabeth Shaw dead? And is she not coming back? Here is the official synopsis, which gives away the basic plot. "Bound for a remote planet on the far side of the galaxy, the crew of the colony ship Covenant discovers what they think is an uncharted paradise. But it actually turns out to be a dark, dangerous world. And the sole inhabitant is the "synthetic" David (Michael Fassbender), survivor of the doomed Prometheus expedition." This arrived from an official press release that came directly from 20th Century Fox. As you can see, only Michael Fassbender is confirmed to return, with no other cast members announced at this time. It was long believed that Alien: Covenant would pick up directly after Prometheus and follow Shaw and David as they made their way to the Engineer's homeland. That may no longer be the case. 20th Century Fox confirms that Alien: Covenant will return Ridley Scott to the universe he created in 1979 with Alien. This will be the second chapter in a prequel trilogy that began with Prometheus. It will connect directly to Scott's 1979 seminal work of science fiction. Back in September, director Ridley Scott was calling his Prometheus sequel Alien: Paradise Lost. And at that time, he seemed to think Elizabeth Shaw was still very much part of this trilogy. But a lot has changed in the past two months. Including the title. About the movie, and Shaw's involvement, he had this to say. Related: Will Blade Runner 2049 Be a Bigger Bomb Than Alien: Covenant? "Have you ever read Paradise Lost, by Milton? In a funny kind of way, it's an interesting basis for the darkness of [Prometheus 2]. Where the good-looking guy, who is evil as s-t, gets all the girls and goes to the nightclubs. The other guy, who is not quite as good-looking, is boring as hell and stays home. So in a funny kind of way, we used that as the basis for it, it'll be Alien: Paradise Lost. Which is very spooky, because it continues after the last one, where Elizabeth Shaw [Noomi Rapace] says, 'I wanna go where they came from.' And you've got Michael Fassbender in two parts, so she'll slowly put him back together. They will go to the world of the Engineer. That's where they're going to go. They will find out who would design such an awful bio-mechanoid creature, like a massive piece of bacteria." Is this still part of the movie? Will it be told in the opening prologue? Or is Alien: Covenant kicking off with David living alone on this planet? It has been said in the past by the director that the movie will introduce the creators of the Xenomorphs at the center of the Alien franchise. Is David that creator? It has also been stated that Alien: Covenant will have a direct relation to Sigourney Weaver's iconic Ripley character. How that ties into the movie is not known at this point. With only Michael Fassbender confirmed at this point, it isn't known when more cast members will be announced. It should happen soon, as Alien: Covenant begins shooting this January. Noomi Rapace's omission from this official PR will surely have people questioning what happened to her. Ridley Scott is directing from a script by Jack Paglen, Michael Green and John Logan. What do you think? Does it matter if Shaw returns? Or does her demise make more sense in the grand scheme of things? As of now, the actress is still listed on the IMDB page for the movie.